Like all parents, Wilhelmina Yazzie wants her children to have an education that gives them the opportunities they need to learn and thrive. But her 15-year-old son Xavier hasn’t been getting what he needs to be college and career ready because the state has been starving our public schools. 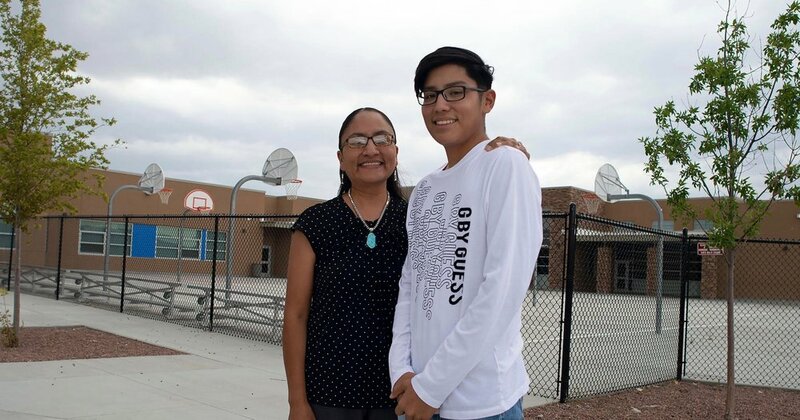 Unfortunately, Wilhelmina’s son Xavier, like so many other students in New Mexico, has not had the benefit of the programming and resources he needs to thrive. An engaged student, he consistently earns good grades but scores below grade level on standardized tests, endangering not only the possibility of attending college, but also graduating from high school. Wilhelmina knows that Xavier’s school and thousands of other schools all across our state desperately need better supports and resources to more effectively serve the students who make up New Mexico’s uniquely diverse student population. She knows that Xavier would benefit from college preparatory classes, instruction that relates to his Diné heritage, after school programs, up-to-date technology, and simply enough textbooks to go around. The problem is that New Mexico has made choices – funding choices – that have deprived our children from their constitutional right to an education that makes them college or career ready. That New Mexico consistently ranks last in education outcomes is the result of opportunity, not achievement, gaps. Data shows that culturally and linguistically relevant instruction, extended learning opportunities, full-day pre-K education for three and four-year-olds, smaller class sizes, and teacher pay that is adequate to recruit and retain teachers are what’s necessary to help low-income, English language learner, or Native American children achieve in school. To date, the state hasn’t done enough on any of these fronts. Wilhelmina knows that there is only so much that her son’s school district can do with the resources it has. So Wilhelmina decided, with support from the Impact Fund and other funders, to sue the state for its failure to uphold its legal obligation to give all students a sufficient education. Several other families and school districts across New Mexico joined her, and the New Mexico Center on Law and Poverty represented them. The case, Yazzie v. State of New Mexico, was consolidated with a similar case, Martinez v. State of New Mexico, brought by the Mexican American Legal Defense and Education Fund. The Yazzie case rests on two main principles. The first is that New Mexico’s children have just as much potential as children anywhere, so there is no good reason for our state’s appalling academic outcomes. The second is that we know what we need to do to provide our children with a decent education. We’ve done the research, we’ve tried the programs, we know what programming and supports are necessary for all of New Mexico’s children to succeed. The court agreed and ruled in July that the responsibility for repairing New Mexico’s education system lies squarely on the state and that the state has until April of 2019 to take immediate steps to ensure that at-risk students have the resources they need to succeed in school. This monumental victory would not have been possible without families like Wilhelmina’s, who decided to fight for the education that all our children deserve. With this decision, the court has said no more excuses and is holding the state’s feet to the fire to make the changes necessary. These changes must include addressing the historic and systemic discrimination that has plagued our state’s public education system since its inception. The state is going to have to meet its constitutional obligation to provide all students a sufficient education. The court has directed the state to put this constitutional obligation ahead of other funding concerns the state may have. In terms of state revenue, education must come first. And it cannot be short-changed. When the state finally fulfills its constitutional obligation to Xavier and all our children, we will all benefit because education is the basic tool we all need to lead a successful life.